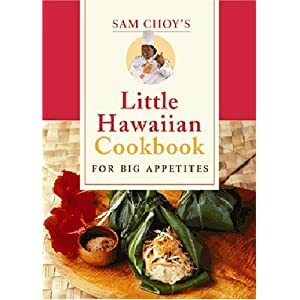 Order Sam Choy's Little Hawaiian Cookbook for Big Appetites - Join celebrity chef Sam Choy in this little celebration of Hawaii’s cuisine. Though the book is tiny, it will satisfy some mighty appetites and introduce you to the world of Hawaiian regional cuisine! Whether it’s stick-to-the-ribs home cooking like Grandma’s Meatloaf and Garlic Mashed potatoes, or elegant party fare like Crusted Ono with Papaya-Mango Salsa, these treasured dishes are sure to be loved by hearty eaters of all kinds.